Before we started our culinary adventures, we indulged in some mimosas and snacks. My best friend and fellow blogger Amy J. 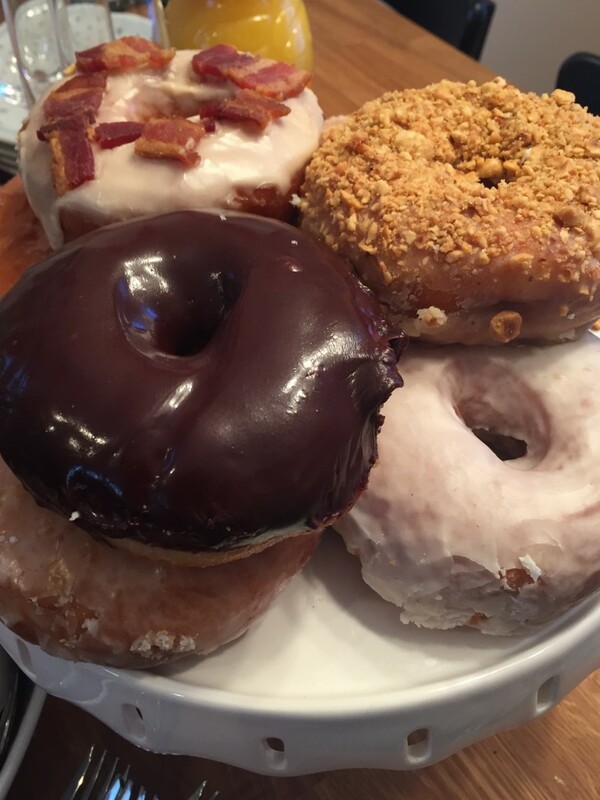 (Amy Party of One) brought some doughnuts from Union Square Doughnuts – doughnuts and mimosas? Yes please. After getting our sugar high in place, it was time to get down to my favorite part of LIFE – cooking. 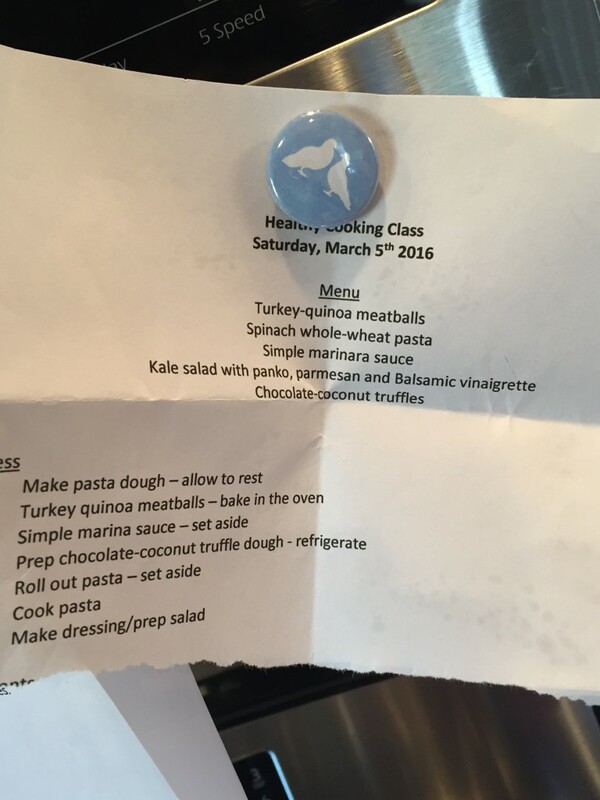 Aimee gave us a download on the menu, which included turkey quinoa meatballs, marinara sauce, spinach pasta, kale salad and coconut chocolate truffles. This was right up my alley, and I was especially excited for the pasta. I had just taken a pasta class the prior weekend and wanted to continue honing my skills on perfecting pasta dough. Aimee gave us a quick download on knife skills; showing us the proper way to cut an onion (there were definitely tears) as well as herbs like parsley which can get tricky. 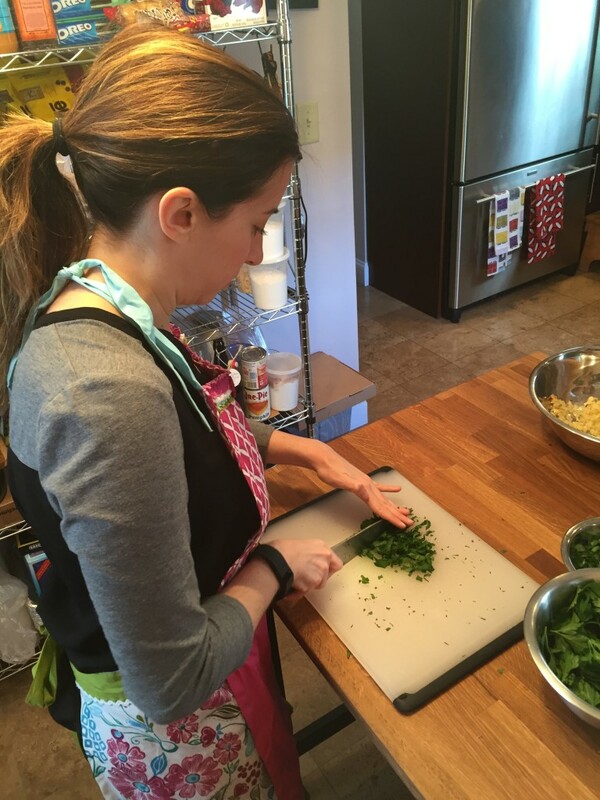 I have Iron Chef knife skills….maybe? Making the pasta dough was the first thing on our agenda, as it would need to rise for about an hour. 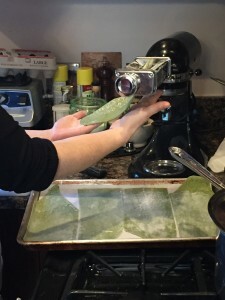 Aimee showed us how she steamed the spinach before adding to her dry ingredients in her food processor. 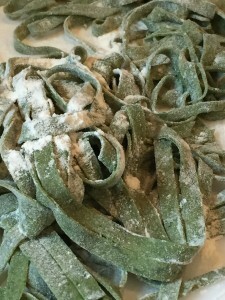 She had never made spinach pasta dough before, but it ended up coming out great! The dough was smooth and had the perfect consistency. 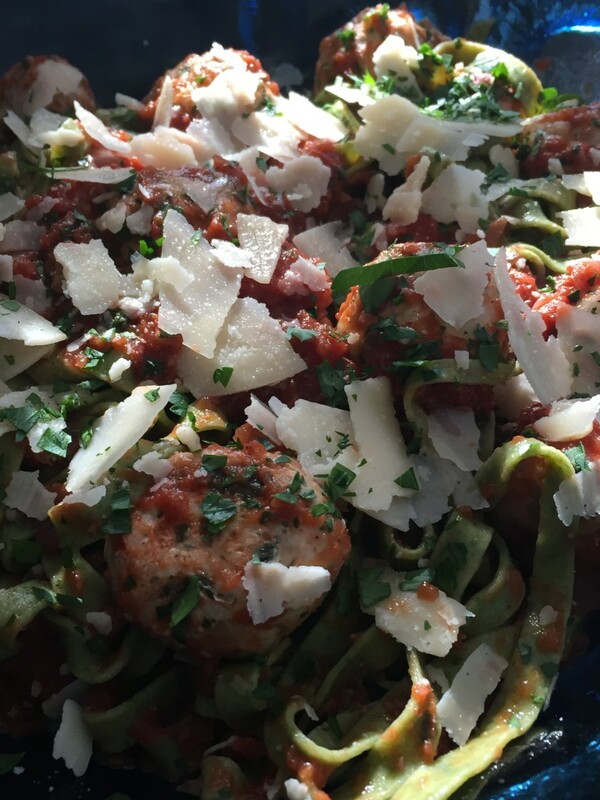 While the dough was resting, we started on the turkey meatballs – since we had the onions and parsley chopped up, we added those ingredients along with the ground turkey, eggs, parmesan cheese, salt and pepper. I learned two new tricks from Aimee – first, always test a small piece of meatball mixture by cooking in a pan before rolling all of the meatballs and second, keep a small bowl of water near you when rolling the meatballs to make the process easier and your hands clean. Life changing!! Once the meatballs were in the oven and the marinara sauce bubbling, it was time to roll out our dough. I have used the KitchenAid pasta attachment previously in cooking classes, but fell in love with it even more. Not only does it roll out the dough, it has another piece to cut the rolled out dough into linguine. It is A LOT easier than the hand crank pasta roller I currently have at home, so definitely need to invest in one ASAP to use with my hot pink KitchenAid. Fresh pasta only takes 2-3 minutes to cook, so once that was thrown into the boiling water, we started to prep the kale salad. I haven’t been a fan of kale in the past, but Aimee informed me that tuscan kale (also known as dinosaur kale) has a different taste. 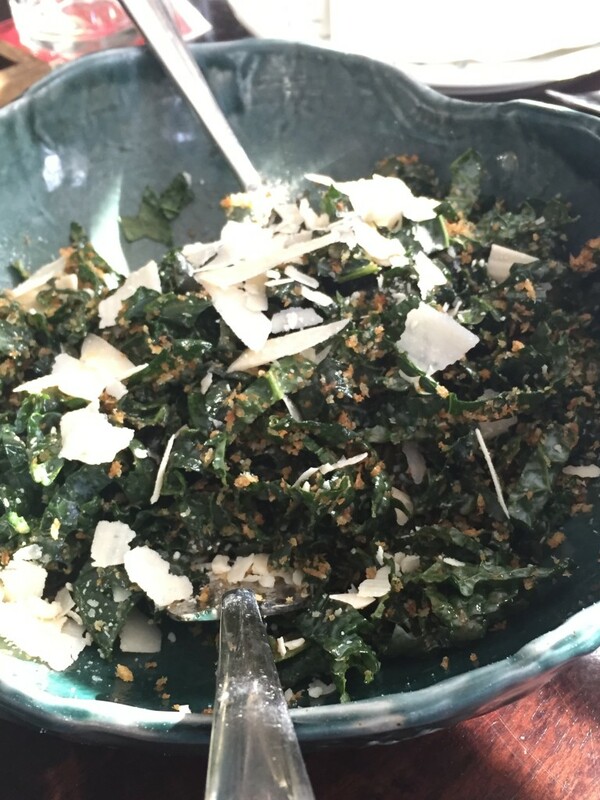 It’s not bitter like other types of kale on the market – in the past I had tried curly kale and swore it off. Once Aimee plated everything (in gorgeous serving bowls!) we all sat in her living room and dined family style. 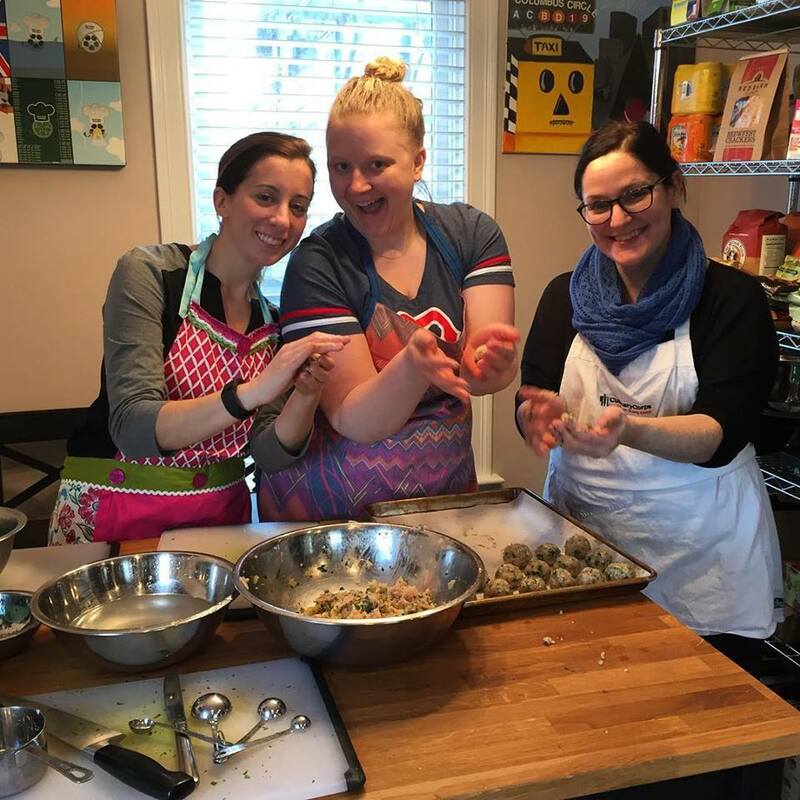 I can’t wait to continue cooking with my friends – especially with the warm weather coming! The meal was AMAZING, and it was great to spend a Saturday afternoon doing what I love, with people I love. this looks like so much fun! although to be honest I keep going back to the donuts, they look so good!